Application lockdown – MS Office etc. Multi-layer detection with heuristics, behavioral analysis, signature detections. Whether you’re working on classified government files or the magic ingredient for your famous lasagna, you need to protect your secrets for walking out the door. Faronics WINSelect offers the ability to disable USB ports and disk drives. Now you can relax knowing your secrets won’t be exported without your knowledge.Ensuring computers are dedicated to their intended use has never been easier than with Faronics WINSelect. Whether you want to lockdown a public access kiosk or lock down workstations across your entire network, we’ve got you covered. Now you can limit everything from applications to printing, while eliminating IT support tickets on everything from one machine to thousands. Say Goodbye to GPOs. Get the ultimate Desktop Lockdown software with the power of Cloud. Available as single product or as a layered security bundle. Faronics WINSelect helps customize the configuration of any Windows computer to perform only the functions you need and prevent any unauthorized usage. Kiosk options help you control public access machines with just one click. WINSelect allows you to automatically launch specified applications right at the start-up. You can also block access to specific menu items, as well as access to specific applications that you don’t want people using. And it’s all done with the click of a mouse. How’s that for simple? for opening, saving, printing, and even timers. In public access environments, you can easily keep machines free of personal data, while controlling what information comes in or out by disabling USB and disk drives. And built-in session timers help you ensure that everyone gets a turn. allow you to control what users can do on the Web. You can disable features within Internet Explore and Mozilla Firefox. You can also freeze the homepage and prevent changes. Or you can create a list of allowed or restricted websites to ensure end users are using the computers for the intended purpose. is easy using the built-in Faronics Core Console. It makes it easy to deploy, configure and manage WINSelect across your network. You can schedule and execute tasks using groups and even apply configuration changes when workstations are powered off. You can even schedule WINSelect restriction times and levels to meet the demands of your unique environment. Faronics Anti-Virus provides comprehensive protection with a combination of Antivirus, Anti-Spyware, Anti-Rootkit, Firewall and Web Filter in a single solution. It allows you to keep your data safe, your computers running fast, and remain infection-free Get the ultimate Integration with Faronics Deep Freeze to ensure effortless anti-virus definition file updates on “Frozen” workstations.Faronics Anti-Virus uses multiple layers of detection including heuristics, behavioral analysis, and signature detections. It protects against new threats with the advanced MX-Virtualization technology for real-time malware behavior analysis in a virtual environment. Includes a Firewall with an intrusion detection and prevention system that contributes to a safer computing experience.Faronics Anti-Virus ranked No. 1 in performance benchmarking. Comprehensive Protection with a combination of Antivirus, Anti-Spyware, Anti-Rootkit, Firewall and Web Filter in a cloud based solution. Available as single product or as a layered security bundle. Integration with Faronics Deep Freeze ensures effortless anti-virus definition file updates on “Frozen” workstations. Extremely lightweight, offers the most efficient use of memory, disk and CPU usage.solution. Deep Freeze Cloud makes deployment, configuration and management of updates a breeze. Average Scan Time on Schedule measures the amount of time requtired to run a scheduled scan on the system. A shorter scan time means a reduced impact due to the scan process on the normal operation of the machine. With over 4,000 machines, IT administrators at Augusta County Public Schools were plagued by malware infections. They frequently spent 60% of their week troubleshooting damaged PCs. Innocent users accidently clicked on hazardous malware including the dangerous Conficker Worm. They used a layered approach with Faronics Anti-Virus, Anti-Executable, and Deep Freeze for the ultimate protection. IT support requests dropped by 60% and they can now enjoy 100% machine availability. The extra peace of mind from enhanced security is a real bonus too! Certified as an « Approved » security product by AV-Comparatives, a renowned independent testing organization that checks whether security software lives up to its promises. Certification was based on its performance in the « Real-World Protection Test », the most comprehensive and complex test available when it comes to evaluating the real-life protection capabilities of antivirus software. Awarded the VB100 certification by Virus Bulletin, a reputed security information portal, testing and certification body, for successfully detecting, on Windows 8.1, all malware known to be ‘in the wild’ at the time of the review, and generating no false positives when scanning a set of clean files. Awarded the VB100 certification by Virus Bulletin, a reputed security information portal, testing and certification body, for successfully detecting, on Windows Server 2008 R2, all malware known to be ‘in the wild’ at the time of the review, and generating no false positives when scanning a set of clean files. Keep your PCs safe with Faronics Anti-Executable. It’s an easy application control solution that guarantees only approved applications are allowed to run. Spend less time troubleshooting damaged machines with the most advanced protection designed to combat zero-day threats and othe dangerous malware. Fill in the security gaps left behind by your anti-virus with the best application control solution available – Faronics Anti-Executable. Easy-to-use, it’s scalable to protect thousands of Windows PCs across your enterprise. Need to protect your servers from sophisticated malware attacks? It’s easy with Faronics Anti-Executable for servers. Stop Threats before they start. Get the ultimate Application Whitelisting software with the power of Cloud. Available as single product or as a layered security bundle. Protect your endpoints with balance of flexibility and security using Faronics Anti-Executable. Protect your identity and keep your computer safe from malware with Faronics Anti-Executable. Flexible control is easy with the built-in Trusted Publisher function. Now you can manage all updates from a specific publisher like Microsoft using one click of the mouse. With four levels of control, you can bring on the details and even specify the right software version for your company. It also comes with folder level control, and USB/CD drive limiting. And the ability to create multiple policies for different departments or user groups. Automation makes getting started a piece of cake. You can leverage your existing Active Directory settings to create the right protection levels for the right users. Once installed, it automatically scans and populates the Control List for you. After you’re up and running, Trusted Publisher helps you manage updates automatically from the software manufacturers you trust. Central management through Faronics Core console allows you to deploy, configure and control with ease. You can add or remove files on the fly and apply them to all relevant PCs in a few clicks. Inside the console, you can tell that the product is working by reading the reports. These reports reveal which programs are trying to gain access to your network most frequently and which machines have the highest number of violations. The Los Angles Police Department was finding too many laptops in patrol cars in need of IT support. Laptops provide an essential connection to intelligence that helps officers protect the community. Damaged laptops forced officers to troubleshoot machines or took the squad car off the streets. With Anti-Executable on the job, mobile laptops are available and secure without depending on IT personnel. Officers now have the tools they need to help protect the community 24/7. North Country Community College found they were faced with too many computers in the shop because they were constantly trying to enforce acceptable use policies for unauthorized downloads. After installing Faronics Anti-Executable, they no longer worry about malware or undesirable programs trying to execute on their machines. In fact, not only are users enjoying continuous availability, but the IT team has saved almost 20 hours each month by receiving significantly fewer support requests. RTP Federal Credit Union was concerned about tightening security on employee workstations in order to protect the financial assets of their members. Handling thousands of financial transactions, data security was of paramount importance and a data breach could spell disaster for their reputation. RTP turned to Faronics Anti-Executable to provide proactive protection for their customers. It’s helped them enforce acceptable use policies, dropped malware incidents and IT tickets, and helps them meet industry compliance standards. The complimentary Faronics Anti-Executable dashboard adds great value to Anti-Executable Enterprise by visualizing the application control enforcement and violation information from across your entire organization in a web browser. By making this information centrally available, IT professionals no longer need to provide information consumers with dedicated access to IT systems for them to generate reports on demand. The Anti-Executable dashboard has custom widgets that provide valuable insight into the various aspects of application control. Information such as recent violations, top blocked programs, top violated computers, violations statistics and charts can now be viewed on a single page. Each widget can be clicked on to launch a detailed report that can be printed or exported into excel, text and other formats. 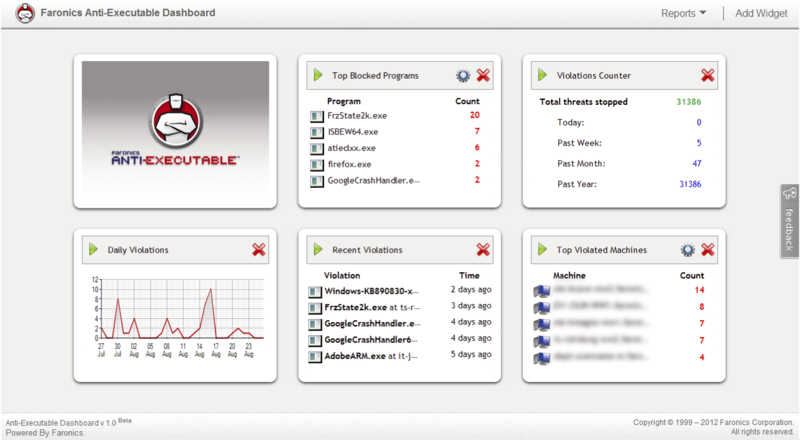 Download the Anti-Executable Dashboard from here. Investigate a file by checking it against the IdentiFile™ database. Making decisions about which files to trust is a routine IT dilemma, but guessing can lead to all sorts of problems. The next time you find yourself questioning the trustworthiness of a specific program, simply look it up in the online database. With millions of hashes stored, it’s a great source of up-to-date information that can help keep your organization safe. And if your file is not entered yet, be the first to submit and help users across the nation. Deep Freeze provides the ultimate workstation protection. It creates a Frozen snapshot of a workstation’s desired configuration and settings. Any unwanted changes are removed upon restart and the computer is returned to its pristine Frozen state. Reboot to Restore and much more offered in a cloud based solution. Available as single product or as a layered security bundle. Customized configuration makes setting up Deep Freeze for your unique environment a breeze. Using the Configuration Administrator, you can specify multiple passwords, select drives to be Frozen, create ThawSpaces to save data, create workstation tasks, schedule maintenance and set advanced networks. You can also create multiple customized installers with different configurations. Easy deployment is made possible with several options. In addition to deploying Deep Freeze system restore software as part of your imaging solution, you can deploy it as a Silent Install natively either as an .exe or as a .msi by using our Deep Freeze MSI Packager. And you can also use the Enterprise Console to deploy. Central Management makes it easy to deploy, configure, and manage Deep Freeze. All you need to do is use the robust Enterprise Console or Core Console included free of charge. Or use the built-in Command Line Interface to manage Deep Freeze from within the most popular desktop management systems such as Microsoft SCCM, Dell KACE, Spiceworks, and Symantec Altiris. Check out our Integration Page. Enhanced security is rolled into Faronics Deep Freeze with protection for the master boot record (MBR) from rootkit injections, making your security bulletproof. The Customization Code ensures that unauthorized administrators are prevented from accessing or controlling a computer that runs Deep Freeze. Administrators can also assign up to 15 passwords or create One-Time passwords that will expire after a single use on the workstation. Windows updates are even easier to automate. You can automatically download Windows updates even when machines are Frozen. Cached updates are applied as soon as the machines are Thawed, which means Windows Updates are much faster. Forget about setting maintenance window completion times, since Deep Freeze just got even smarter! It can now detect when updates are complete and automatically return the computer back to a Frozen state. It’s easy to say just how easy Deep Freeze can make your life, but you’re probably asking how exactly it will do that. It’s simple, just like this! No hardware to buy. No management server needed to install. Everything is in the cloud making set up quick and easy. Designed for any number of computers within your network and offers central management. Designed for 1-10 computers without central management requirements. Designed for any number of Macintosh computers. Designed for managing individual servers. Faronics WINSelect allows you to easily lock down PCs. Anti-Executable keeps PCs safe by stopping sophisticated threats like zero-day malware. Faronics Deep Freeze provides advanced system to restore on reboot. 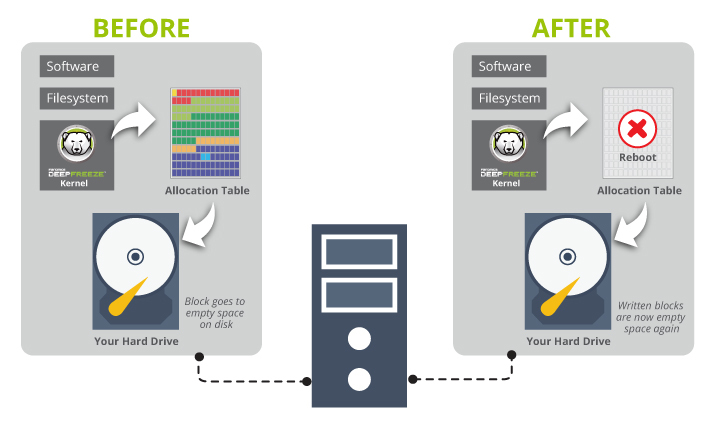 Save your time by just a simple reboot rather than reconfigure, imaging solutions etc. Faronics WINSelect fonctionne avec les ordinateurs utilisant Windows 2000 SP4, Windows XP SP3, Windows Vista et Windows 7 (32 et 64 bits). Les programmes pris en charge incluent Microsoft Office 2000, XP, 2003 et 2007 ; Internet Explorer 9.0 ; et Mozilla Firefox. La configuration recommandée de Faronics Core peut être trouvée dans son mode d’emploi. Faronics Anti-Virus fonctionne avec les ordinateurs utilisant Windows XP SP3 ou plus récent (32 et 64 bits), et Windows Vista SP1 (32 et 64 bits), Windows 7 (32 et 64 bits) Windows Server 2003 et 2008 (32 et 64 bits). La configuration recommandée de Faronics Core peut être trouvée dans son mode d’emploi. Faronics Anti-Executable peut être installé sous Windows XP SP3 32 bits et Windows XP SP2 64 bits, ainsi que Windows Server 2003, Windows Server 2008, Windows Vista et Windows 7 versions 32 et 64 bits. La configuration recommandée de Faronics Core peut être trouvée dans son mode d’emploi. Les spécifications matérielles sont les mêmes que celles exigées par le système d’exploitation hôte. Il est aussi disponible en version Standard pour les ordinateurs indépendants et les machines d’entreprise connectées en réseau. Deep Freeze requiert Windows XP/Vista/7/8.1 et 10 % d’espace libre sur votre disque dur. L’Administrateur de configurations Deep Freeze et la Console Enterprise ont besoin de Windows XP/Vista/7/8.1 pour fonctionner convenablement. La configuration recommandée de Faronics Core peut être trouvée dans son mode d’emploi. La configuration matérielle recommandée est la même que celle du système d’exploitation hôte. Entrevue avec un responsable informatique heureux, qui a adopté le logiciel ANTI VIRUS et INSIGHT de Faronics pour l’ensemble des postes élèves de son établissement. Listes noires ou listes blanches : quels logiciels choisir ?